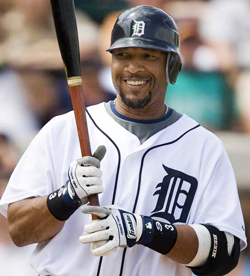 Gary Sheffield's chase for 500 home runs will have to wait for the 2009 season, but that suits him just fine. 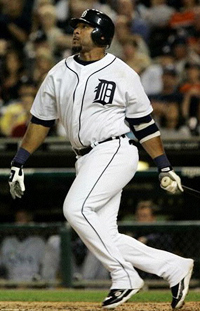 For the Detroit fan favorite who ended 2008 with 499 career home runs, joining the prestigious 500 Home Run Club® is just another reason for him to look forward to next season. After a late September surge left the veteran slugger on the brink of cracking the landmark home run mark, including two homers during the final homestand to get to 499, the “Iron Shef” went homerless over the final three games of the season. Click here to see Sheffield’s 499th career home run. Perhaps the most frustrating game for Sheffield was his 0-for-3 with a hit-by-pitch and a strikeout lackluster showing in the season finale against the White Sox. A fervent family man, Sheffield had a suite full of family members, including his uncle, former Major League pitching great Dwight Gooden, at his final 2008 home games, but it just wasn’t to be. "I was more so pressing [in Detroit] than today," Sheffield said after the final game of the season. "I was just trying to do whatever it took to win our last series of the year. That's just the way it goes sometimes." Sheffield has talked a great deal about how much he looks forward to next season. Now that he feels healthy, with his right shoulder strong, he'll have a chance to go through his regular offseason routine for the first time in about five years. But hitting career home run number 500 has to be right at the top of the list of things to look forward to. A worthy candidate for enshrinement into the 500 HRC brotherhood, Sheffield's .293 career average would rank higher than half of the other 24 members. He needs one stolen base for 250; a milestone only three 500 HRC members have reached. His .395 on-base percentage would rank in the top 10 among his soon-to-be colleagues. And only Ted Williams and Mel Ott have 500 homers with fewer strikeouts. Sheffield’s often-seen confident smile reflects the one quality that numbers can't quantify. That's the incredible love of the game that has constantly pushed Sheffield throughout his career. Happy New Year Gary and here’s to a great 2009!